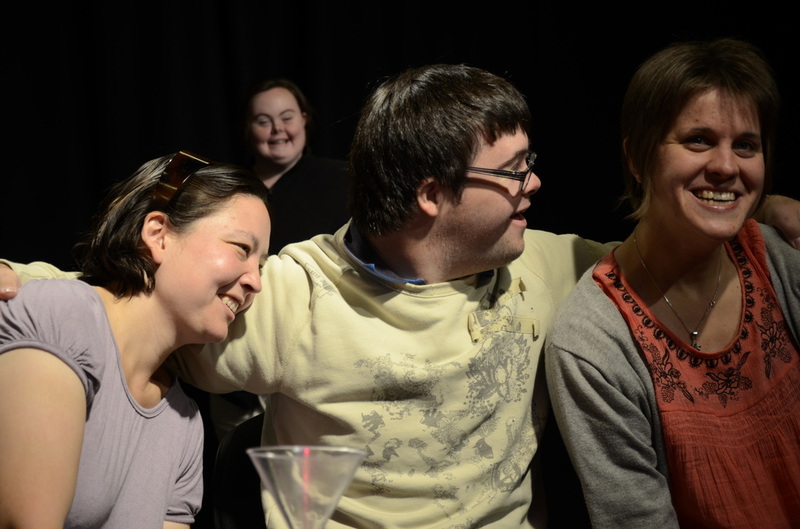 Here you will find information about up-coming shows, our weekly rehearsals and other interesting projects we are involved with. 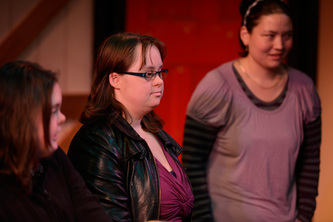 Josie Noble playing Dr Kate Hunter and Ben Morris as Dave Knobs. 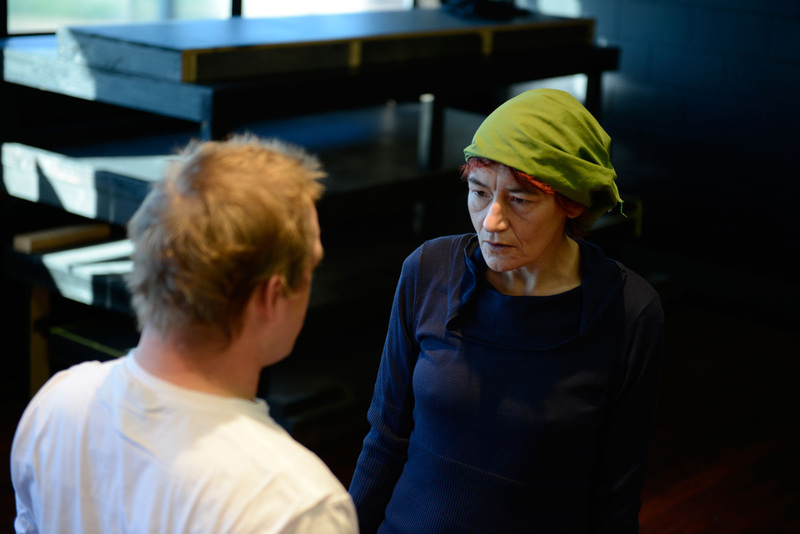 Josie Noble as Dr Kate Hunter exclaims "Its four o'clock in the morning!" having been woken by Dave Knobs played by Ben Morris. 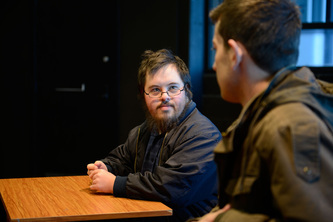 Peter Reese stands over Andrew Dever in a scene from The Lonely and the Lovely. 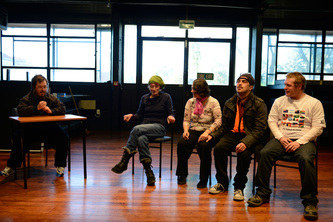 Sign language applause from the cast of The Lonely and the Lovely. 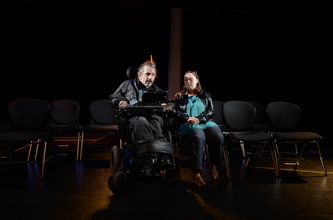 Glen Burrows smiles in the opening tango of The lonely and the Lovely. Last night was opening night for 'The Lonely and the Lovely' everything went well except with the weather, the rain beat hard on the roof of the theatre throughout the show, a freak storm which unfortunately coincided exactly with our performance. The seven performers who are travelling to Sydney to represent Different LIght. 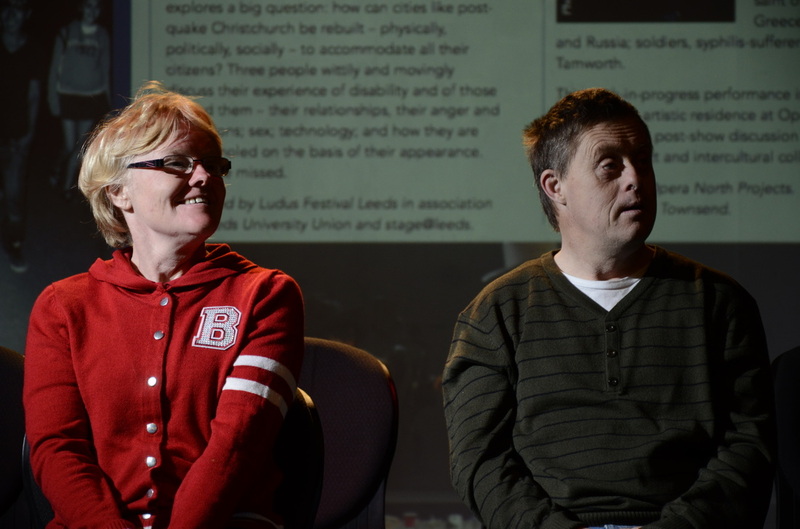 21st June Follow us at Ludus Festival on the TravelBlog! The last group rehearsal before Ben, Glen and Isaac leave for the Ludus Festival in Leeds, UK. 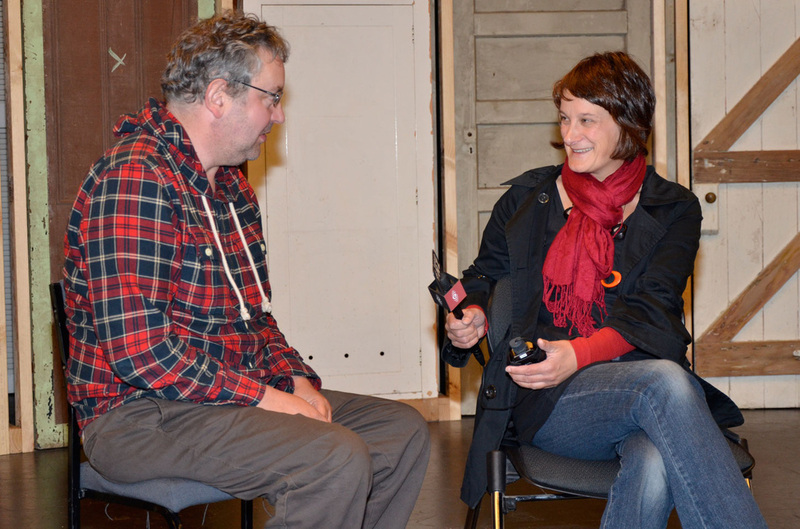 Click on the player below to listen to the interview broadcast 17th June 2012 on Radio new Zealand National 'One in Five'. "One in Five meets A Different Light – a mixed ability theatre company – who leave for England this week to show their latest production at a contemporary performing arts festival. 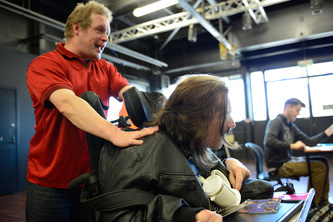 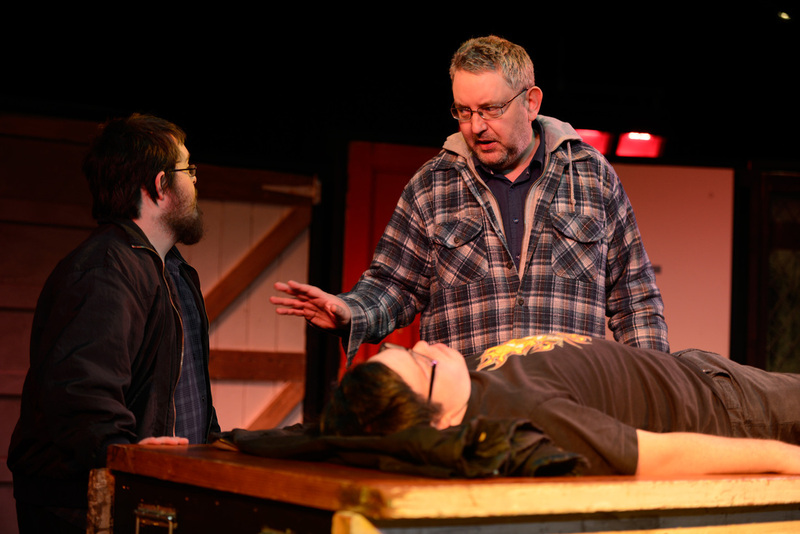 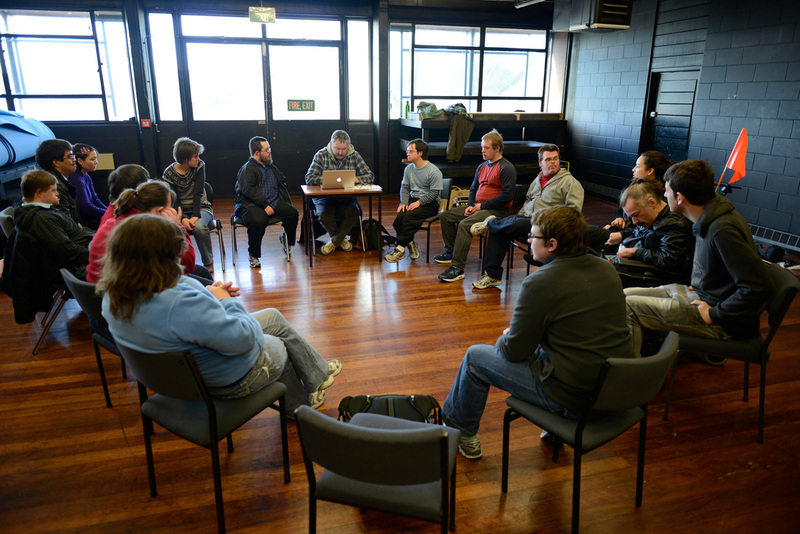 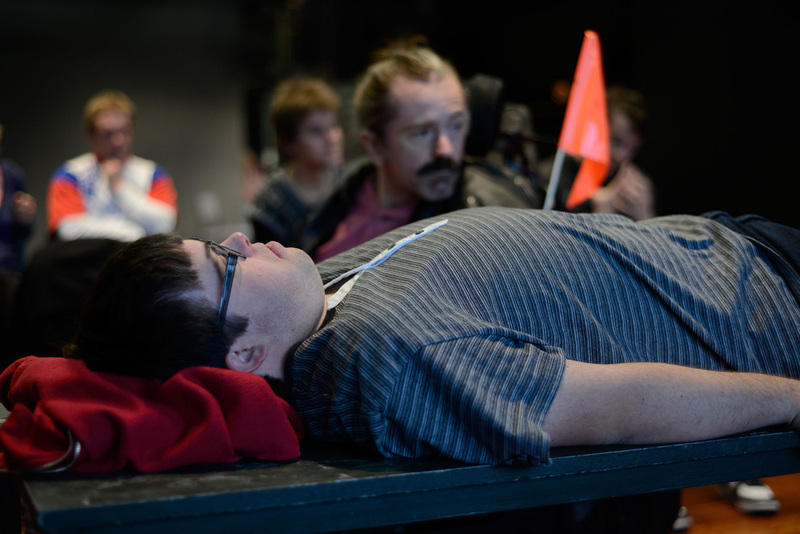 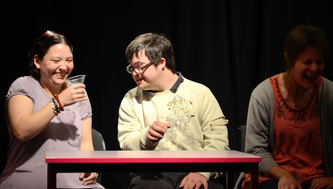 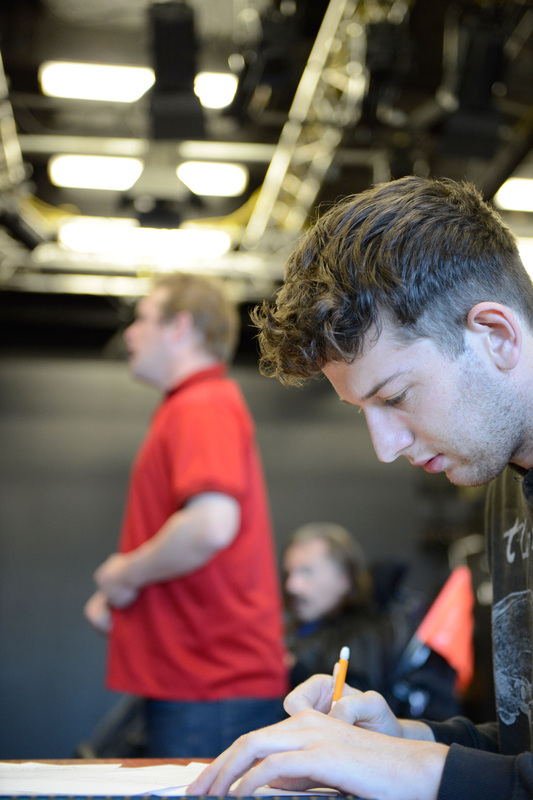 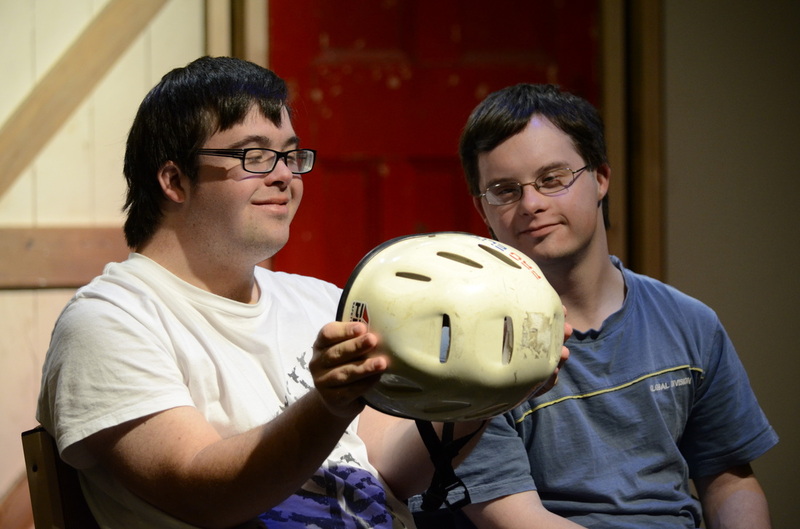 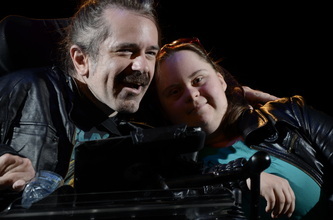 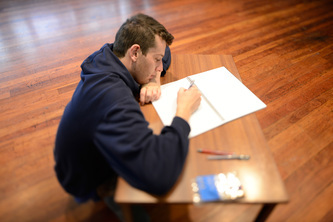 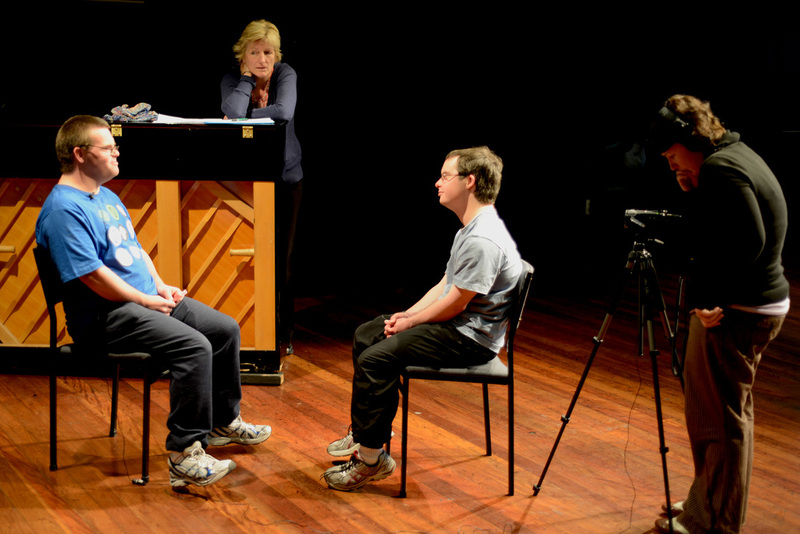 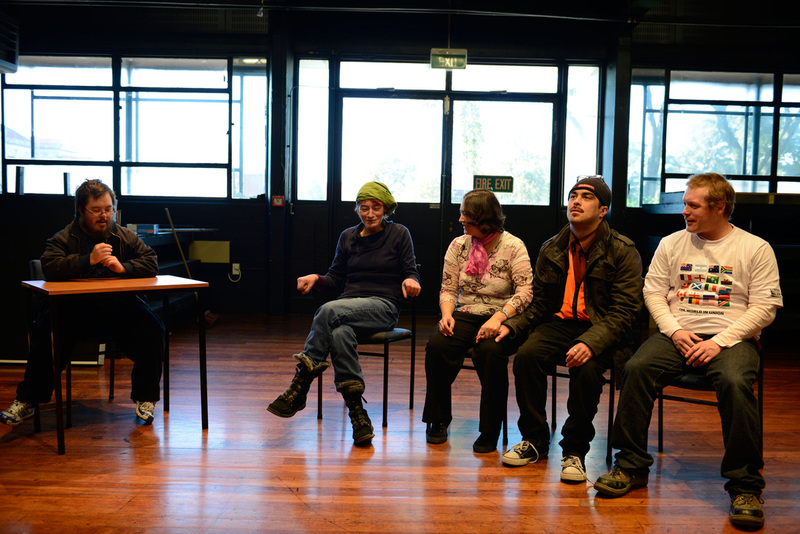 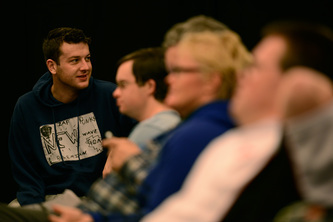 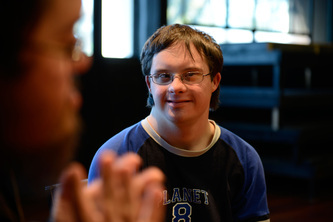 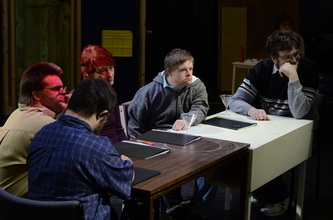 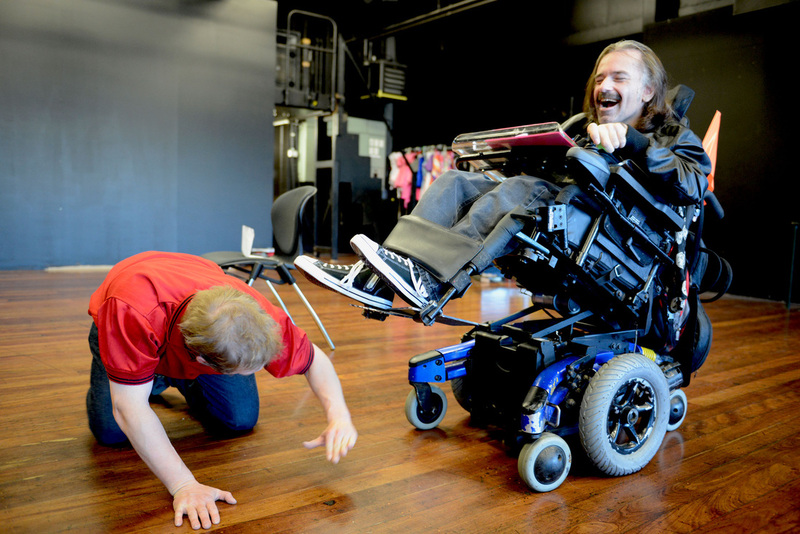 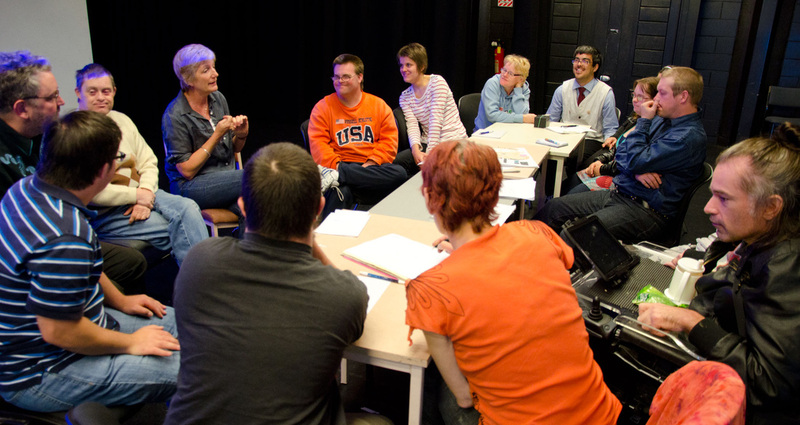 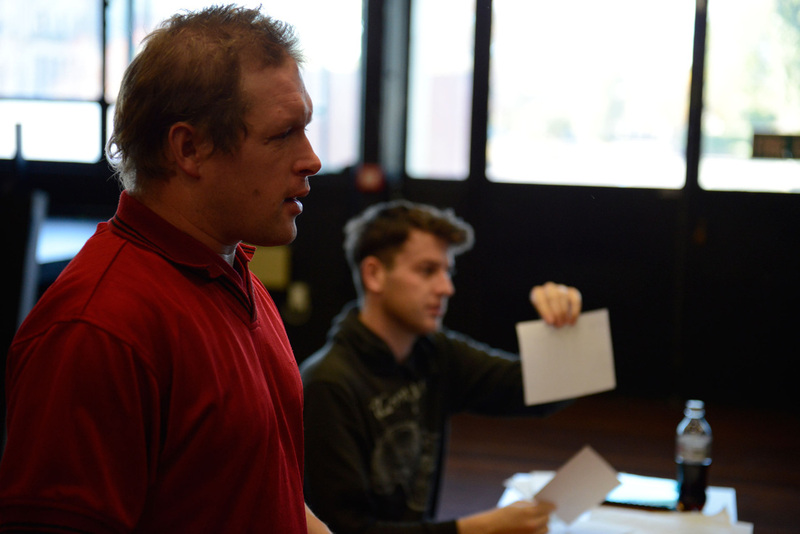 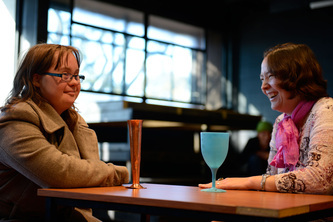 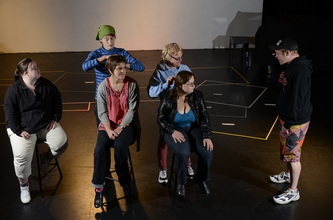 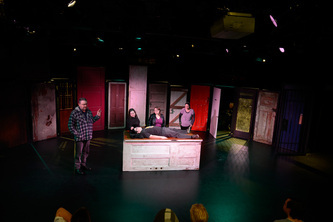 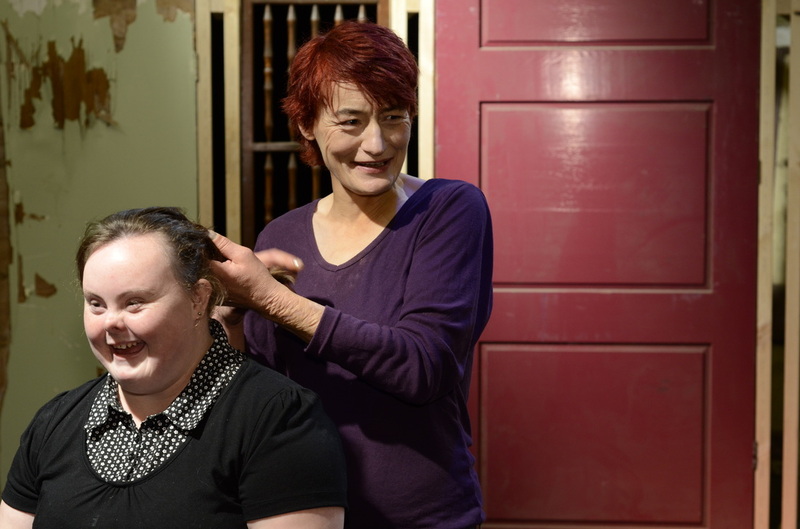 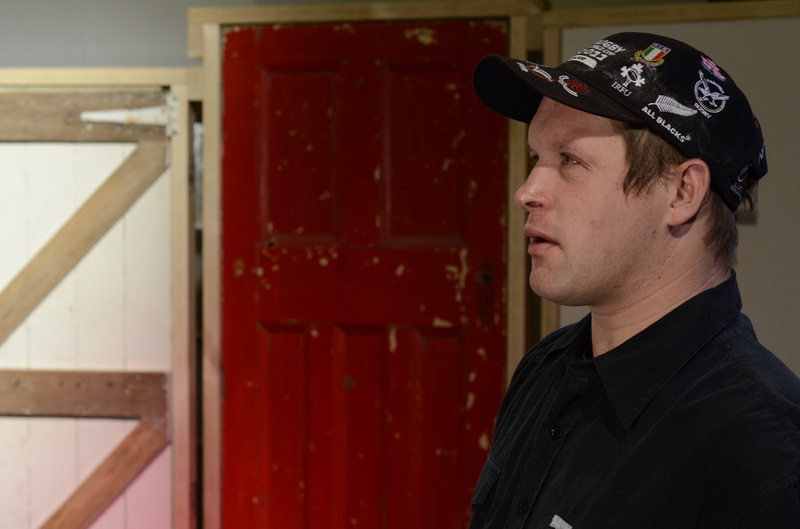 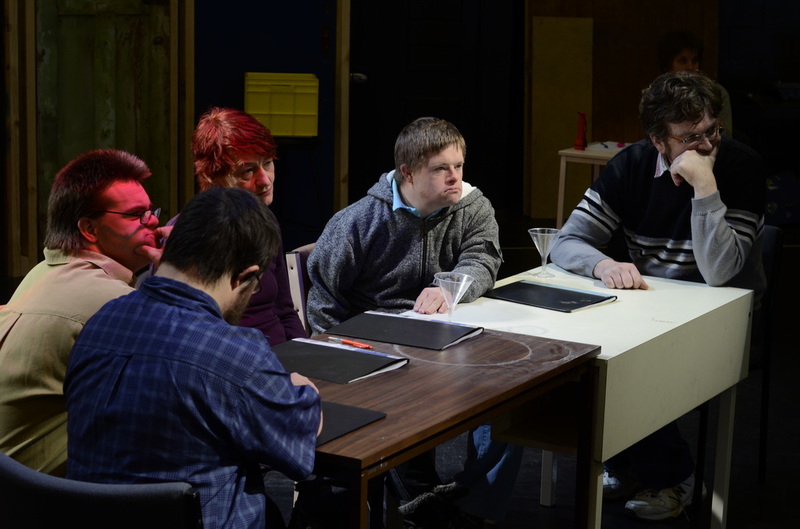 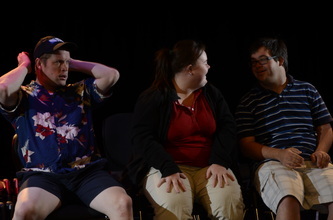 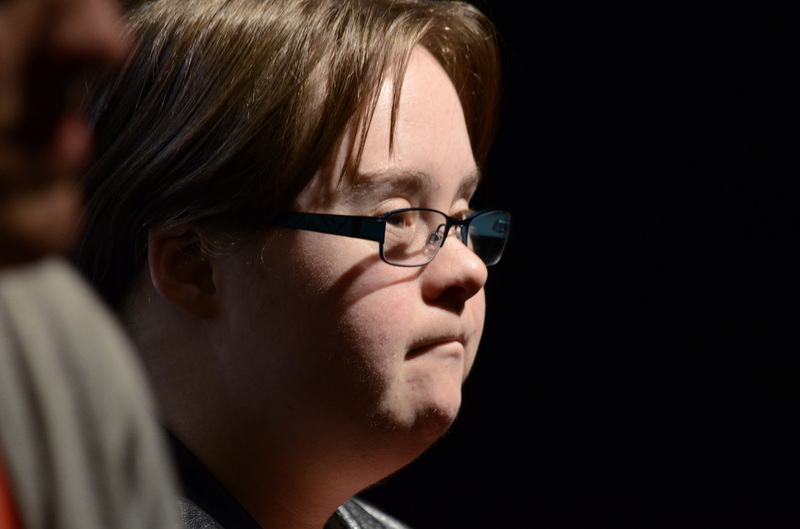 The show – Still Lives – was written and developed by the Christchurch actors and is based upon their own experiences of living with a disability. 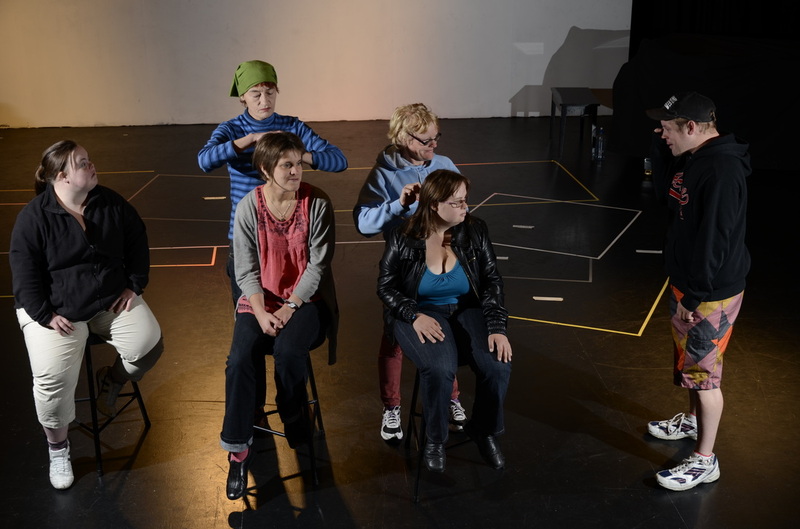 The company has won Creative New Zealand funding to take the show to the Ludus Festival in Leeds. 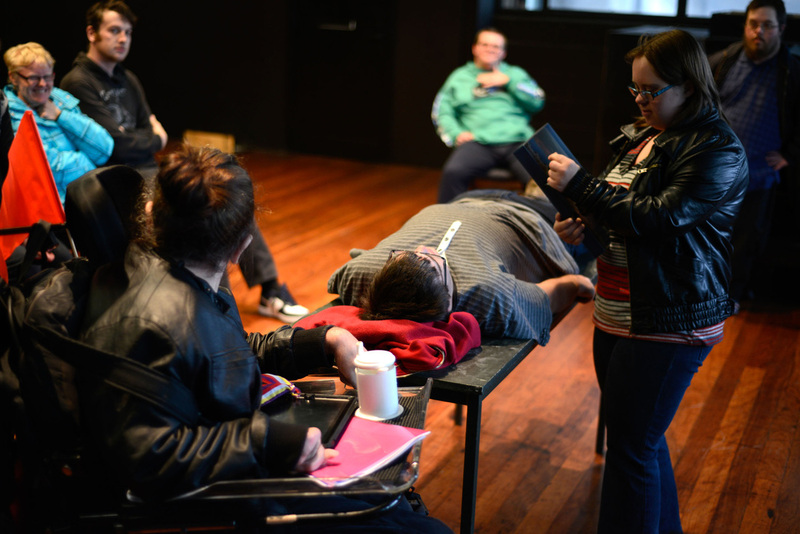 A Different Light has been working together for eight years and last year performed the Society for Disability Studies Conference in San Jose, California. 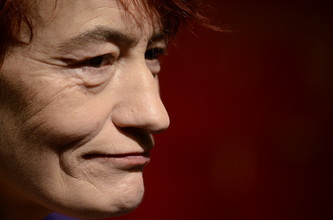 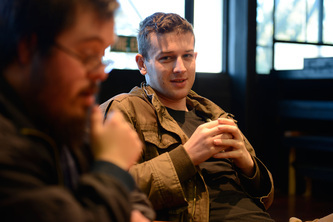 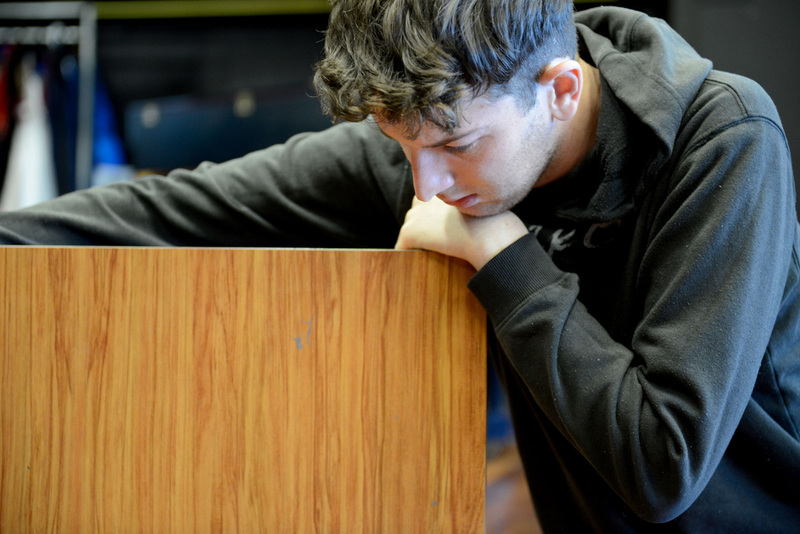 The company's director, Tony McCaffrey, says by allowing the actors the time to express themselves, they are developing new voices and writing their own material. 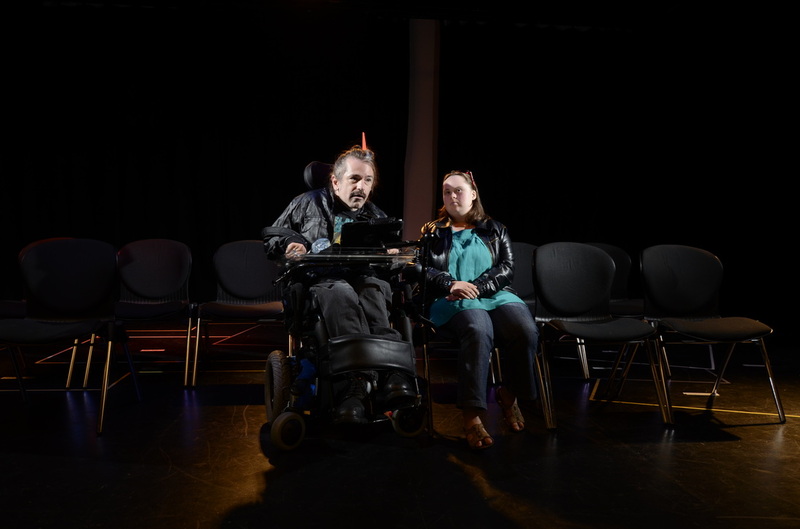 He says A Different Light has also been invited to make a keynote presentation/performance of its new soap opera, The Lonely and the Lovely, at an Arts Access Australia Conference in Sydney in October. 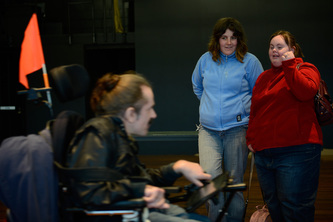 Katy Gosset dropped in on the actors during one of their final rehearsals." 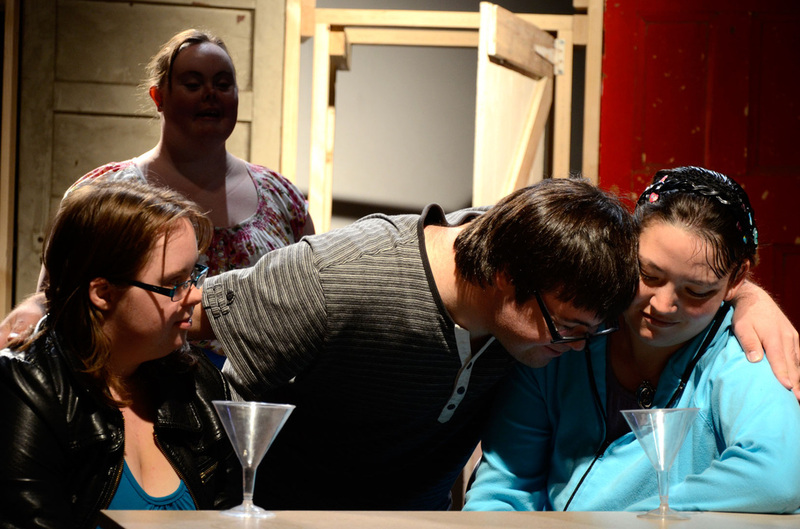 Ben, Glen and Isaac work on Still Lives while everyone else prepares scenes for the soap opera. 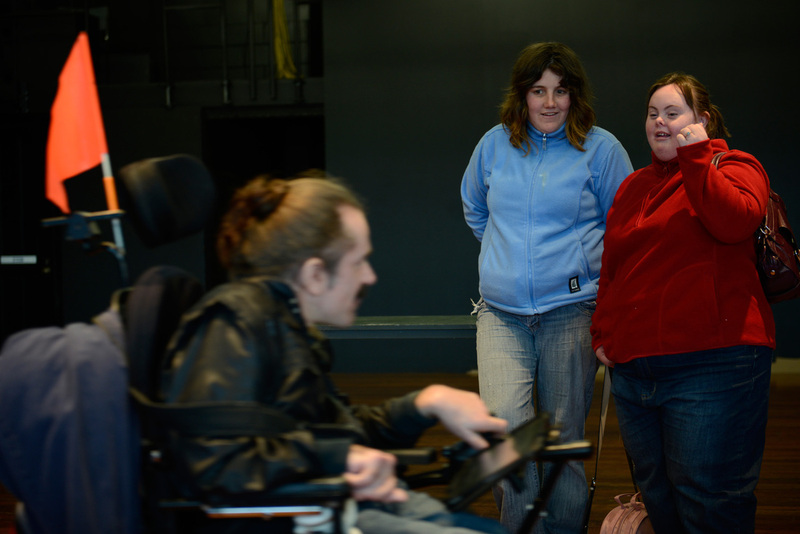 Workshopping ideas and new scenes for the soap. 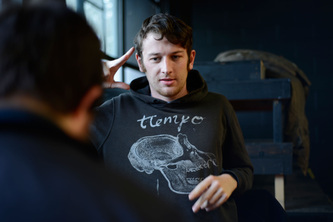 Isaac provides live animation for a scene from Still Lives. Trisha from IHC came in to do some interviews whilst rehearsals continued in the background. 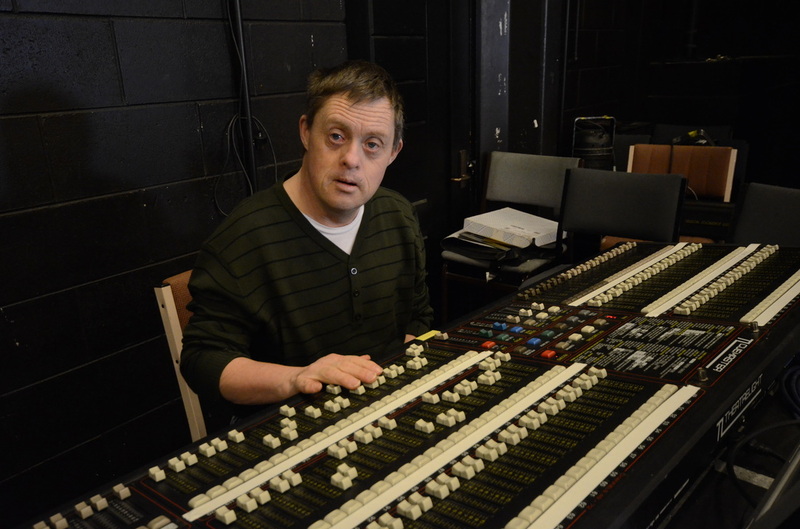 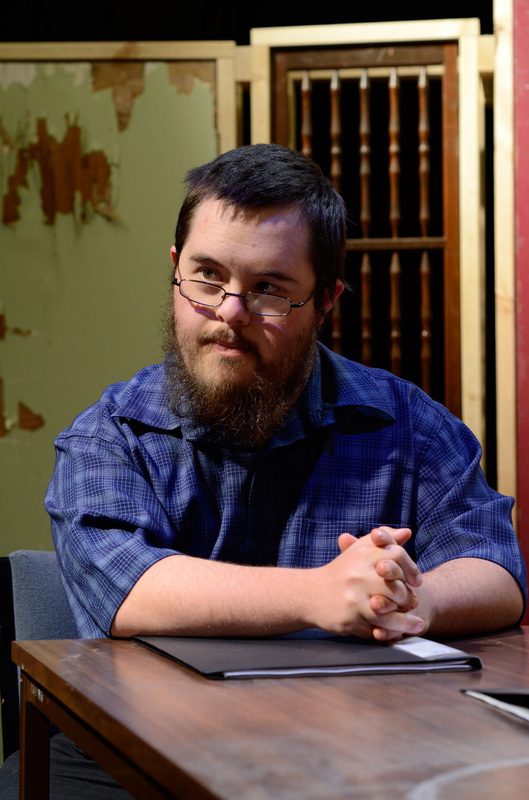 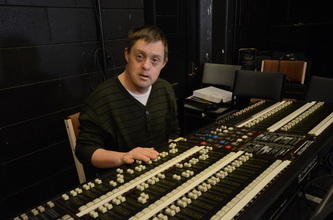 Katy Gosset interviewed Ben Morris, Isaac Tait and Tony McCaffrey for the Radio New Zealand National program "One in Five" about their experiences of working in mixed ability theatre and the upcoming trip to the Ludus Festival in Leeds, UK. 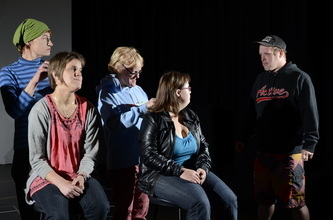 Andrew Dever, Josie Noble, Caroline Quick and Natalie Walton rehearse a scene for the upcoming soap opera. 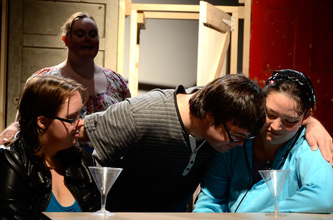 Devising new scenes and developing the script for the soap opera. Devising and developing the soap opera. 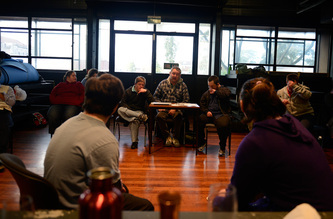 Different Light Theatre Company meets every Sunday morning at the CPIT NASDA Theatre, on Madras St, in Christchurch New Zealand. We Rehearse from 9:30am - 12:30pm. 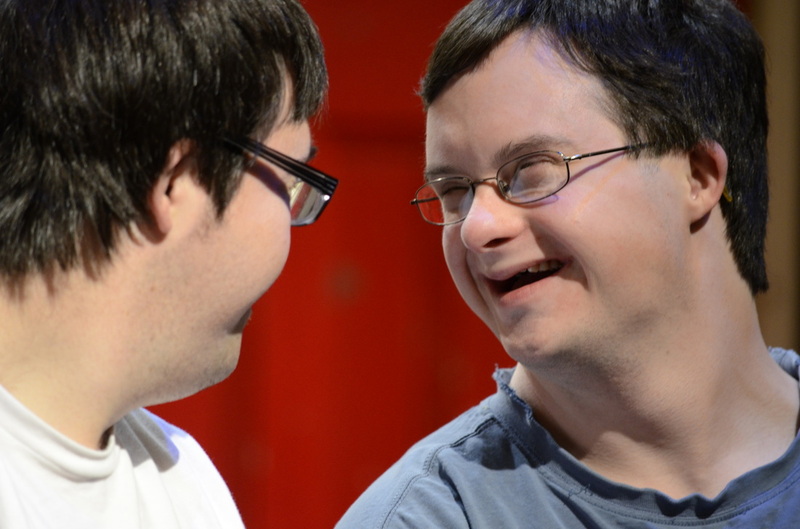 If you are interested in finding out more about us please fill in the form on our Contact page. 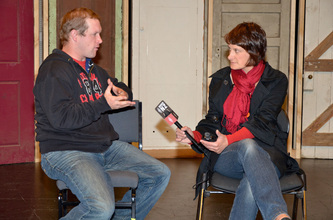 After the Feb 22nd Earthquake we met at the Buddhist Centre on Riccarton Road.